The Hudson River is once again visible from Olana’s main house, the steep slope beneath the main house has been re-established based on a sustainable and native planting plan, and the large spiraling retaining wall which elevates visitors to the front door of Olana’s main house is once again in great condition. 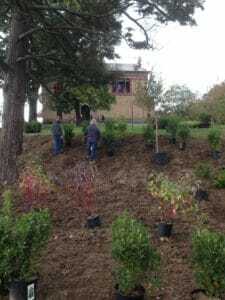 The final approach to the main house has been restored and replanted. The terracing of the lawn in front of the main house has been restored and sodded. 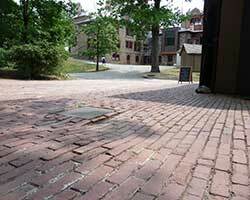 Accessible parking, curbing and the bus turnaround have been improved. 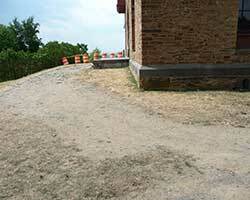 Crown Hill is a rare spot at Olana. It was designed by Frederic Church in 1887 to provide panoramic views over Olana itself. At the southeast corner of Olana, at a height of 349 feet, the peak of Crown Hill provides a singular view. 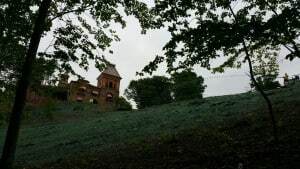 Church led visitors up Crown Hill for a middle-ground view of his singular house on an opposing hill, a sweeping foreground of parkland and orchard and farm buildings, and a vast backdrop of northern sky, ever-changing. It was a thoroughly composed view, much in the way Church composed his paintings. 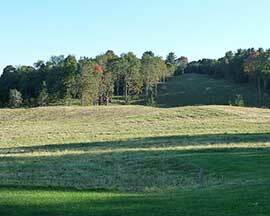 Crown Hill also provided views east toward the Taconic Range and the Berkshires, but — it should be noted — not one glimpse westward, toward the famed Catskill Mountains and Hudson River.Crown Hill and the views from it are once again visible. Construction began in 2013, thanks to a NYS Environmental Protection Fund grant which was secured and matched by The Olana Partnership. 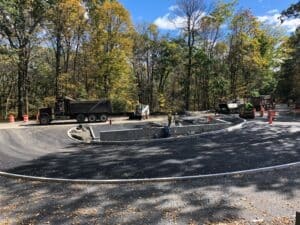 Saratoga Associates, a well-regarded landscape architecture firm in New York, worked on all aspects of design and construction in cooperation with New York State. This project, which is the first stage of Crown Hill’s restoration, included the removal of second-growth vegetation and the establishment of a native meadow. Mr. and Mrs. Church’s bedroom suite (including a dressing room) and a guest room were restored in 2005-2012. For many years these rooms had been used for storage of historic collections materials. 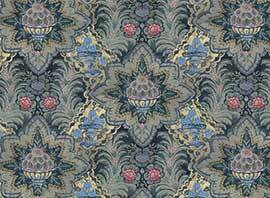 Restoration work began with extensive research by Olana’s curators. Fragments of original wallpapers and stencils were uncovered, and replicated. Furnishings documented to the rooms were put back in place. The rooms were opened in 2010 and 2012 and now demonstrate the lifestyle of the Churches and their guests. 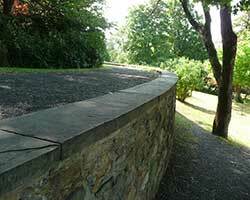 All work at Olana is done in reference to a long-range comprehensive plan (2001) for the site. A copy of the full report is available here or upon consultation. Contact the Curatorial Department via Email.